Basket-hulled boats appear to be unique to Central Vietnam, and their present-day geographic distribution is congruent with the historic culture area of the primarily Austronesianspeaking Champa from modern Quang Binh to Binh Thuan. It is believed that no modern Cham population in mainland Southeast Asia still regularly uses boats for transportation or fishing, but the Vietnamese of Central Vietnam traditionally used a large variety of hand-made row- sail- boats with sewn planked upper hulls and flexible hull bottoms. The flexible hull bottoms consisted of woven strips of bamboo that have been caulked with various substances including buffalo dung, tree resin, flaked malaleuca leucadendron cork, coconut husk fibers, and/or ground bamboo. 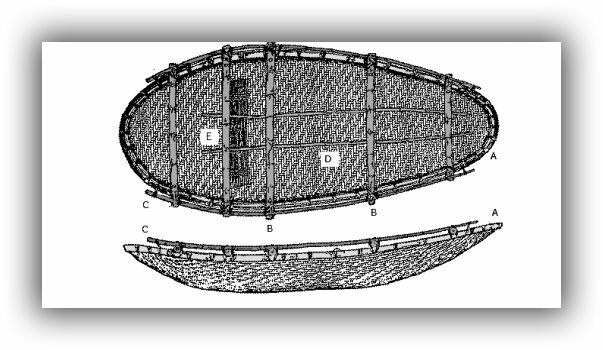 The wovenbamboo basket-hulled boats ranged from small circular coracles (thúng) to ocean-going sailing boats with a capacity of 100 tons or more of cargo. This unique boat technology appears to be an indigenous independent development peculiar to the Austronesian-speaking Cham people that could date back several millennia. However, all evidence of attributing the origin of the boat technology to the Cham is circumstantial. There is much research that could be done to illuminate the Cham connection to traditional boat technology in Vietnam. The following research questions are suggested: (1) conduct additional maritime archaeology to find early historic or prehistoric examples of basket-hulled boats; (2) search the large body of Cham-language manuscripts for descriptions of boat and fishing techniques; (3) complete the planned inventory/ethnology of boats in Vietnam that was proposed by the British Museum; (4) determine why this geographically unique distribution of boat architecture did not spread outside Central Vietnam; and (5) determine if the Cham population of sailors and fishermen historic were the same as the Cham population that were primarily farmers. This entry was posted in Archaeology [Khảo cổ học], History [Lịch sử] and tagged Anthropology, Archaeology, David G. Sox, Maritime, Nước ngoài. Bookmark the permalink.